ENGINEERS are preparing to move an Antarctic research station because it is in the projected path of a crack expanding across the ice shelf. 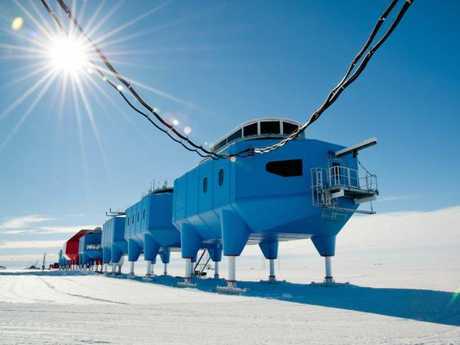 The British Antarctic Survey (BAS) base was built like a "very long railway train on skis", allowing it to be moved with relative ease, but scientists did not expect to have to relocate so soon. 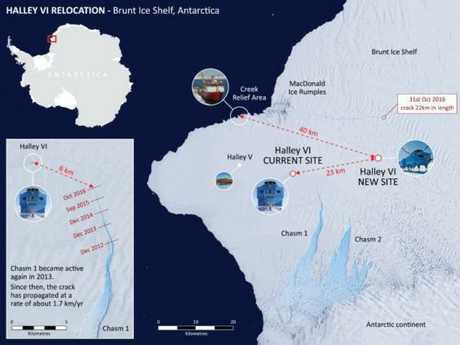 Shortly after the brand new "Halley VI" centre was towed to its current coordinates in 2012, a chasm that had been dormant for at least 35 years began to open up once again 4.3 miles away. David Vaughan, BAS director of science, said satellite imagery suggested the crevasse could potentially isolate the centre from the mainland. "The chasm, if it continues to grow, will eventually produce an iceberg and if we left the station where it is at the moment it would be on that iceberg," he told Sky News, explaining that the organisation intend to tow the centre over 14 miles inland across the ice to safety. The centre was designed to make relocation possible, he said. "It is made up of separate modules, carriages if you like, each of which is sitting on four skis, it gives us the opportunity to separate each of the modules and tow them separately, using caterpillar tractors, to a new location, and then fit the whole station back together again," he added. The station is on Antarctica's 150-metre-thick Brunt Ice Shelf, a floating ice sheet which is constantly flowing at a rate of a quarter of a mile per year towards the sea, where, at irregular intervals, it "calves" off as icebergs. "All ice shelves do this. It's a natural event," Hilmar Gudmundsson, a glaciologist at BAS, told New Scientist. 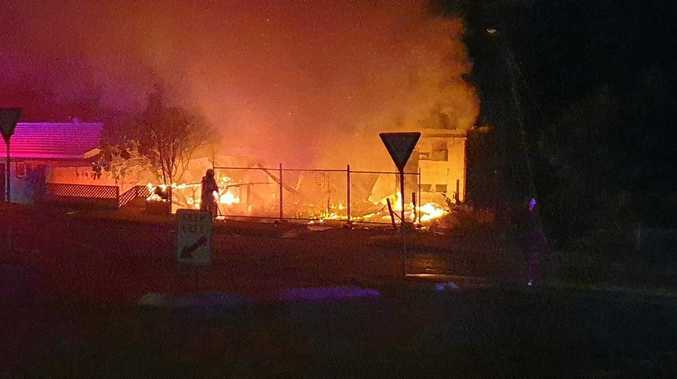 "But it's difficult to say exactly when and how large these events will be. It's a bit like trying to predict an earthquake." It is not known if the growth of the crack is related to global warming or how it will develop, she said. "We don't know what will happen. It might stop growing, but we can't exclude the possibility of a big calving event," she told the magazine. In October, a second crack emerged in the ice about 10.5 miles north of the station, across a route sometimes used to resupply the base. Alternative paths have been used since. Halley is crucial to studies into globally important issues, such as the impact of extreme space weather events, climate change and atmospheric phenomena. It was scientific investigations from the current site that led to the discovery of the Antarctic Ozone Hole in 1985. Tim Stockings, operations director at BAS, said: "Over the last couple of years our operational teams have been meticulous in developing very detailed plans for the move and we are excited by the challenge. "Antarctica can be a very hostile environment. Each summer season is very short - about nine weeks. And because the ice and the weather are unpredictable we have to be flexible in our approach." He added: "We are especially keen to minimise the disruption to the science programmes. We have planned the move in stages - the science infrastructure that captures environmental data will remain in place while the stations modules move." Preparatory work for the relocation was carried out during the 2015-16 Antarctic summer season, which runs from November to March. The planned move will be completed in gradual stages by April 2018, allowing scientific research to continue in temporary facilities at the existing site.